The most important piece of advice for anyone who's ever started a business is, "Find a niche and fill it." A few years ago I remember hearing about an online dating service specific to farmers and ranchers, which I thought was a nifty idea (don't remember the name, sorry). After all, why not cater to a specialized group of people who have a hard time connecting? And now someone else has taken a vacant niche and filled it. 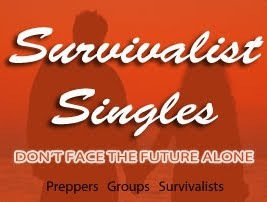 A reader just sent me a link to an article about another online dating service, this one catering to Preppers and Survivalists, called Survivalist Singles. The slogan is, "Don't face the future alone." The article is written with just the barest hint of disbelief -- as in, who in their right mind could possibly think anything could ever go wrong? -- and takes the obligatory extreme examples (humanure) to demonstrate the mindset of preppers. But coming from the mainstream media as it does, it's otherwise a reasonably fair examination of this void in the dating world, though links interspersed throughout the article still poke fun at the tinfoil-hat wearing subculture ("My doomsday tab: $130K on bunkers, guns and more," "9 signs the world will end in 2012," etc.). The mainstream media, it seems, is simply incapable of separating the loonytoons from those with serious concerns about our future. But no matter. It's kind of a nifty concept, the idea of linking Preppers together. Fill that niche! Oh wow, great story!! Sounds like an article to me... (wink).